Let’s start with the apples. Wife took the kids to pick up apples at Aunt Marion’s house (sometimes the kids get confused and call her grandma aunt marion or even Maid Marion…lol). Kids had a ball. Aunt Marion refuses to slow down. She was convinced my 7 year old son couldn’t lift the bucket of apples. Wife was convinced Aunt Marion couldn’t lift the bucket of apples…wheezing as she was. It was a hot morning but everybody worked hard. The pigs were pleased with the fruit of their labor. 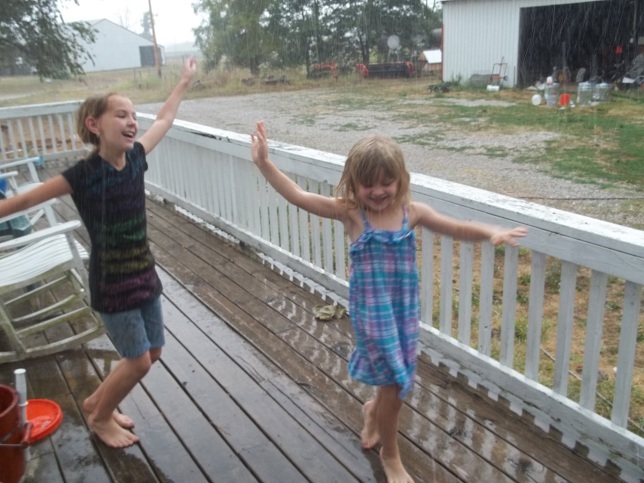 Then…wait for it…..wait for it……IT RAINED! It rained and rained and rained. Four and a half inches in 2 hours! The pond filled up and there were even puddles in the driveway! But nothing comes without a cost. It cost us our computer and our phones. Lightning struck the phone line outside of our home somewhere and our DSL modem sparked inside the house. Though the hardware checks out I can’t get the PC to boot. I’d say that’s a fair trade for a full pond. Oh, and the roof leaks! Isn’t it wonderful?!?!? Merry Christmas Mr. Potter! 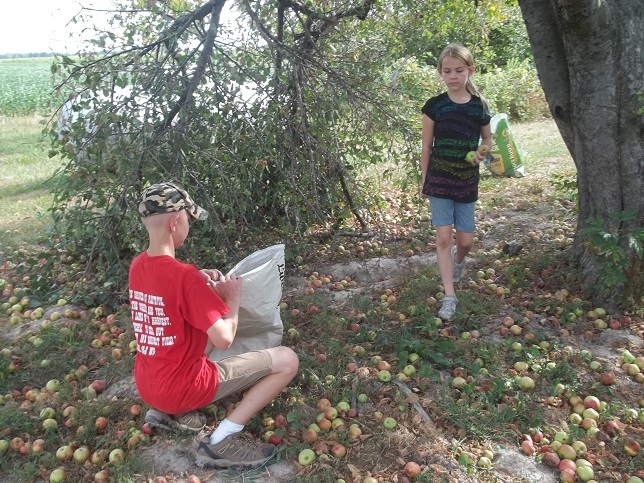 This entry was posted in Children on the Farm, Seasonality and tagged Apple Drops, Drought Relief. Bookmark the permalink. Connie once told me a storey about balls of light coming out of the electrical sockets and rolling across the floor of their house. If look in that direction for the strike point. So happy that it rained for you all! It RAINED!!!! Computer and leaky roof notwithstanding, you do indeed have a wonderful life Mr. Potter. Wow, that is a lot of apple drops. And from the trunk in the picture, that is a BIG tree – do you know how old? This is why houses in this neighborhood should have lightning rods. We got struck too – no rods. Nothing serious showing up – yet. Yup, I love that picture too.